Facilities Guests are welcomed in the lobby. Individual storeys are accessible via the lift or stairs. Amenities include a baggage storage service, a safe and a currency exchange service. Wireless internet access in public areas (for a fee) allows travellers to stay connected. Among the culinary options available at the hotel are a restaurant, a cafÃ© and a bar. Guests can buy souvenirs at the gift shop. Additional facilities at the accommodation include a newspaper stand. Those arriving in their own vehicles can leave them in the car park of the establishment. Available services and facilities include a babysitting service, a childcare service, room service and a laundry service. Active guests can make use of the bicycle hire service to explore the surrounding area. Rooms Each of the rooms is appointed with air conditioning, central heating, a living room, a kitchen and a bathroom. The basic features of most rooms include a balcony. Many rooms feature a sea view, which further enhances the ambience. The rooms each feature a double bed. A safe and a minibar are also available. Additional features include a fridge, a microwave and a tea/coffee station. An ironing set is also available for travellers' convenience. Little extras, including internet access, a telephone, a TV and WiFi, contribute to a great stay. Slippers are laid out in each of the rooms. The bathrooms are fitted with a shower and a bathtub. A hairdryer and bathrobes are provided for everyday use. Sports/Entertainment A refreshing dip in the indoor or outdoor pool is an enjoyable way to cool down on hot days. The poolside bar serves a selection of refreshing drinks. A range of options are available, including a gym, a spa, a sauna, massage treatments and hydrotherapy applications. Meals The accommodation offers breakfast and dinner. Payment The following credit cards are accepted at the hotel: American Express, VISA and MasterCard. 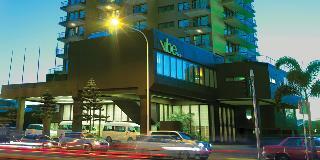 This elegant city aparthotel is situated just one block away form the pristine sands of Surfers Paradise Beach. 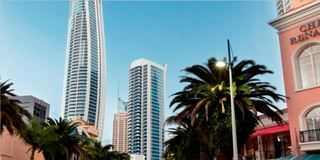 The resort is located close to Cavill Mall, in the pulsing heart of the entertainment precinct and the main business district of the Gold Coast. The Gold Coast Convention Centre is situated a 5 minutes' drive away, while Warner Brothers Movie World is a mere 20 minutes' drive from the hotel. The Gold Coast Coolangatta Airport is just a 25 minutes' drive from the hotel.The captivating apartments offer guests sleek, contemporary designs, with soft, refreshing tones reflecting the natural beauty of the surroundings. The apartments command spectacular beach views on one side, and city panorama on the other. Guests are whisked away to a veritable paradise with unprecedented beauty and style.